We shared recently some tips for on-page SEO for plumbing websites, and hope that post was helpful for thinking about how to develop strong, optimized webpages that help you get more calls for plumbing repairs in your area. After all, the best content writing out there won’t help you move the needle on business if the detailed work of organic SEO isn’t employed. Knowing that your primary website is just part of a solid internet marketing strategy, let’s chat today about how you can leverage Off-Page SEO to catch the eye of new customers. Also known as “off-site SEO,” giving attention to sources outside of your main plumbing website — while still recognizing that resource as a pillar of your web marketing plan — is a great way to help meet customers wherever they find your business listings (also known as “citations”). Because potential clients will not find you by searching your business name directly (unless they are at the navigational stage of searching), you need to have good content about your services and make sure your NAP is correct across the web so that any directory listings or secondary websites (like social media plumbing pages) are ready to make a good impression. 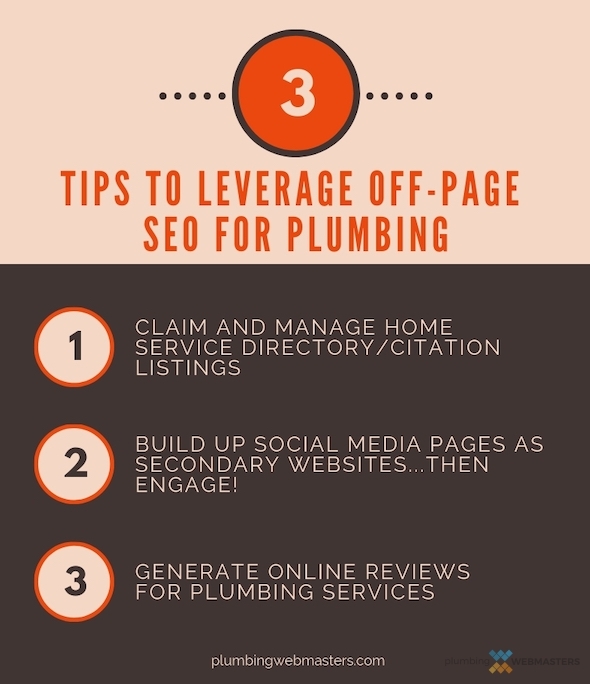 Let’s review some specific ways that you get more business from off-page SEO efforts, and how you can implement a robust approach to plumber SEO overall. Unlike other industries such as food or personal care services, home services are unique in that a quick Google search for plumbing repairs will often include a list of many home service directories like HomeAdvisor.com. These are also referred to as citation listings, as they are another flagpost, so to speak, for establishing your company as a pro in your field. So while building an awesome website for plumbing services is necessary, it could take a newer domain a bit to optimize (which can be frustrating). While PPC options can help get the visibility to drive business, coupled with a strategy to optimize for low-hanging fruit long-tail keywords, these directories are another way for your name to keep coming up for clients in your area. It’s not uncommon for homeowners to connect with a repair specialist without ever having visited their website, so the value of citations can’t be overstated. Knowing that your business information is listed in an online directory for plumbing services is good and well, but don’t miss out on the opportunity to make that citation work for you and stand out from the crowd. Homeowners don’t have time to look through every single company mentioned when they need a plumber, so the more you can take advantage of the editable fields and any badges or bling to make your company look distinguished, the better. Personalize the listing as much as possible, too! Add photos and make sure your company brand is represented as strongly as you’re able. Some directory listings intentionally keep things pretty vanilla, but others really let you put your mark on things and have opportunities for earning badges for reviews, adding business information, or simply being a member for a while. These things matter to catch the eye of customers in a highly competitive market, so don’t hesitate to upgrade if needed to make your listings more prominent, especially if you’re getting steady referrals from the site! I’ve said it over and over again, but if you (or whoever manages your social media accounts) only logs in to fish for leads, you’re going to sink. Not only will your social media presence look spammy and salesy, but you’re going to take a hit from the algorithms that drive traffic and views for the various social media platforms. Nearly all of the social sites are going to prioritize engagement — or as Facebook puts it, “meaningful interactions” — given that the goal is social interaction. That’s why the exist, so you’ve got to respect the medium or you’re not going to leverage your social business pages as an opportunity for off-site SEO. And yes, technically, just having your business represented across the various social platforms is helpful to signal to Google that you’re a legit business and improve search rankings. But it doesn’t have near as much weight as if you actually use those pages well. Interact with followers, respond to comments, post valuable content, and actually show up like you want to be a member of that online community. That’s what it is, afterall, and if you just take with no give, you’re missing out on cultivating a great network for leads and referrals! One of the primary factors that consumers look at these days when making buying decisions — including which plumber to call for repairs — is online reviews. There are many online review sites, like Google, Yelp, Angie’s List, etc., and the key is to have a nice representation across all of them. Quality matters, but so does quantity in the world of online reviews for businesses, so don’t hesitate to ask customers for feedback. It is totally acceptable (and wise, in fact) to direct customers to specific sites to start to build up a reputation across the web, because search results will often pull several sites to show on the Google Home Page. The overall star rating on a given site is usually considered as a cumulative “score” when quickly vetting who to call, but once a potential client starts diving deeper into your business (presumably because of a decent star rating), they’re going to want to know what people are saying. Until you build up a nice volume of reviews to keep the weight on the positive side, you may have to run interference on any less-than-stellar reviews that trickle in. It happens to almost everyone, and is often the result of really unreasonable circumstances, but handling a poor review with grace and integrity can actually trump the foul feedback altogether. On the other hand, if you don’t respond to negative reviews (or even OK feedback that leaves an opening for you to interject for the benefit of your business), it’s assumed that the criticism is correct and/or that you don’t care. (The latter assumption is worse.) And bear in mind that viewers will give more weight to reviews coming from actual clients, versus those who never got a call back or simply didn’t like their quote. Either way, represent yourself well in the face of negative reviews, and your professionalism will go a long way in leaving a positive impression, even in light of a bad review. While it would be so much easier for web marketing if company websites were the only measure by which search engine rankings were decided, it ultimately benefits everyone to look at a comprehensive approach. The interwebs are multi-faceted and different sites serve very different people. Making sure you have a strategy for everyone is a great way to avoid leaving business on the table. Demographics vary, but every homeowner or business owner is a potential client — after all, we all need plumbing! So make the most of off-page SEO as part of a robust plumbing internet marketing plan to help clients find you, as well as make sure Google knows you’re legit.